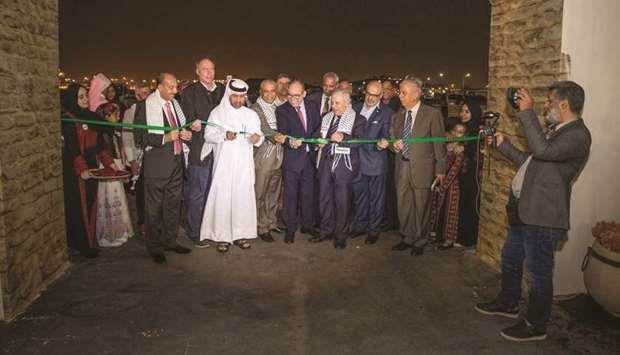 (MENAFN - Gulf Times) Set on the coastline at Katara near St. Regis Hotel — the ongoing Palestine Cultural Festival continues to attract visitors from different communities living in Doha. The festival a yearly feature started on April 4 and will continue until April 13. Organised by the Embassy of Palestine in Qatar in collaboration with Katara—the Cultural Village Foundation, the festival has been offering a host of activities and cultural shows, highlighting the Palestinian heritage. The festival was opened by Katara general manager Dr Khalid bin Ibrahim al-Sulaiti, along with several dignitaries and diplomats. The festival includes daily shows at a big stage set up in the arena showcasing various cultural aspects. These include Zajal, which is a type of Palestinian poetry, as well as the folkloric Palestinian dance, Dabke, and coral operetta. The event also features a traditional Palestinian market displaying various types of handicrafts and food from Palestine. It has also introduced some young Palestinian talented artistes such as Mohamed Basyouni, who has been brought from Gaza to perform traditional Palestinian songs at the festival. Further, a puppet show for children explaining the Palestinian cause and to raise awareness about the struggle of the Palestinian people has also been a crowd puller. The final day of the festival will be themed ‘Jerusalem Day' and witness the hosting of renowned Palestinian musician Bassem al-Ashqar. Talking to Community, Ammar Anbtawi, representative of Final Vision Event Management and chairman of the organising committee, said: 'Our mission is to bring Palestine to Qatar. The festival is generally divided into three main parts. First phase is the traditional Palestinian market where we have brought different kinds of stuff such as food, handicrafts, recycled jewellery, foot wares and other items directly from Palestine. 'We also have numerous participants coming from Palestine —showing their skills in embroidery, making designs on olive wood, ceramics, and gypsum etc. the other phase is related artistic performances. We have some artistes coming straight from Palestine to carry out live performances for the visitors every evening in the pleasant weather. A Palestinian artist has also exhibited her paintings at the festival. The artistes have been presenting different songs, traditional dances, and folk dances such as Zajal. We have a young singer — nine-year-old Mohamed Basyouni who has been performing daily. Honestly speaking, the boy suffered while trying to come to Qatar because of the border situation. It took him one week to get the chance to reach here. He was supposed to attend the opening ceremony but he could not. The organiser further explained: 'In the festival, we have 42 shops. We have two restaurants with two small pushcarts selling traditional Palestinian sweets. We have around 56 people coming from Palestine for the festival. We started setting up the festival in 2016 and now it has become an annual feature. However, we could not organise it last year. We have an understanding with Katara that it will be held every year at the same venue. Ammar expressed his happiness over the response of his community and other people to the festival. 'The response has been more than what we have expected. We have the visitors all the day — even the weather is little hot in the day time. The market area is open at the day time. The cultural and musical activities start in the evening. We have visitors from all backgrounds and from all communities. The organiser thanked Katara for providing the logistic supports and Ooredoo, the official sponsor. 'We are eight people in the organising committee for the festival. There are about 30, 000 Palestinians living in Qatar. Sana Jaffery has a small shop selling silver and aluminium jewellery. She said: 'I recycle silver jewellery to make new designs. I also use aluminium to make jewellery designs. I live in Ramallah. I have been to Qatar for the fourth time. I like to be here. The people here are very kind. We feel that we are in our home. 'My special items are recycled silver jewellery. We are five women and work together to recycle and design silver jewellery. Amjad Zaghal, a young Palestinian man, has brought different foot wares from his country. He said: 'I come from Hebron city. I work as a shoe seller for a shoe company. We have our own factory in the city. It is great opportunity for us Palestinians to sell our products and introduce our famous items outside Palestine. This is my first time in Qatar and people here are very lovely and friendly.